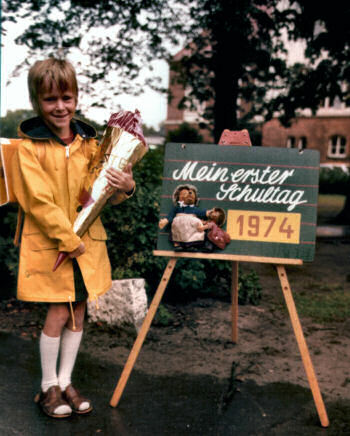 Well, help is at hand, from a Canadian in Germany: Almost a month ago Christina (aka Mausi) wrote about starting school and in particular 'Schultüten' in Germany. Remembering that I had a picture of me with my 'Schultüte' somewhere on my harddrive (thanks to my mother, who scanned a lot of pictures from our childhood a few years ago) I bookmarked the entry to blog about it some day. This is the entry. Thinking about it, may be I could start a meme with this? Something like 'post a picture of you on your first day at school'? Did Stuart wear a kilt on his first day at school? Was Ralf dressed like an art-director or like a little punk rocker? Did Konstantin have a Schultüte? Was Matthew a little geek when he started school? How many gadgets did Josh have in his schoolgadgetbag? I demand to know. Ideally with proof in form of a picture. Come on, join in. And pass it on.